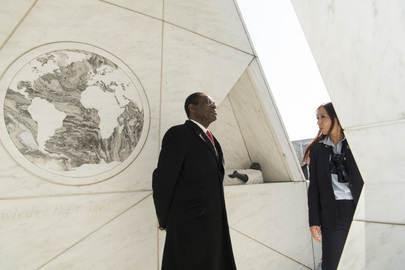 Teodoro Obiang Nguema Mbasogo, President of the Republic of Equatorial Guinea, gets a tour of the "Ark of Return" from United Nations tour guide Smahane Nounouh from Morocco. The "Ark of Return" is a Permanent Memorial at UN Headquarters designed by architect Rodney Leon, to honour the victims of slavery and the transatlantic slave trade. Equatorial Guinea was one of the top contributors to the memorial.